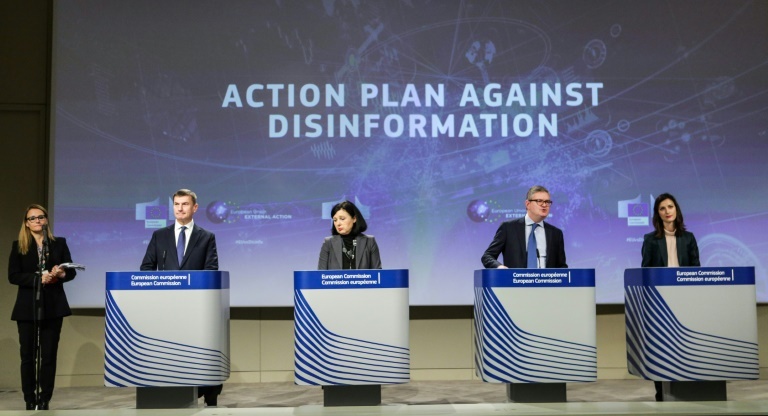 The EU on Tuesday urged advertising trade associations and US internet giants to intensify the fight against disinformation campaigns from suspects such as Russia, ahead of European elections in May. The European Commission said Google, Facebook, Twitter, Mozilla and trade groups have made “some progress” toward meeting their pledges to fight fake news by removing fake accounts and checking suspect sites. His remarks came as the Commission, the 28-nation European Union’s executive arm, issued its first report on how well internet actors were doing in meeting pledges made late last year in a code of practice to fight disinformation. The Commission said “additional action is needed to ensure full transparency of political ads” by the start of the campaign in EU member countries for the elections. It also urged platforms to provide access to their data for research purposes, and to ensure cooperation between the platforms and member countries through the Rapid Alert System. Planned for March, the system will allow members to share data and analysis on propaganda campaigns and promote what the bloc says will be objective communications about its values and policies. Andrus Ansip, the EU’s vice president for the digital single market, said: “Signatories (to the code of practice) have taken action, for example giving people new ways to get more details about the source of a story or ad. “Now they should make sure these tools are available to everyone across the EU, monitor their efficiency, and continuously adapt to new means used by those spreading disinformation,” the former premier of Estonia. Ansip, whose country is especially wary of Moscow after decades under Soviet rule, has warned that Russia embraces disinformation in its military doctrine and strategy to divide the West. Moscow has repeatedly denied allegations of hacking and meddling in foreign elections through disinformation over recent years. The Commission has warned it could take “regulatory” action if the online platforms fail to honour the pledges they signed in a code of practice last year. On the eve of the Commission’s progress report, Facebook on Monday unveiled new tools to counter online political meddling. The US tech giant’s vice president, former British deputy prime minister Nick Clegg, said in Brussels that the methods would become available in late March and help “make political advertising on Facebook more transparent”. The new rules will require a wide range of political ads linked to the European elections on May 23 to 26 to be specifically authorized and tagged with a clear “paid for by” disclaimer.